RADNOR, PA – March 17, 2015 – Community Energy, Inc. announced today that Harry A. Warren, Jr. has joined the Company as Executive Vice President. 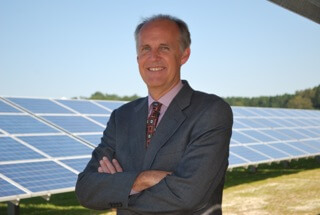 “Harry built one of largest and most highly regarded competitive energy marketing companies in the nation, and he established a leading reputation in that industry for promoting renewable energy,” said Brent Alderfer, President of Community Energy, Inc. “We’ve known and worked with Harry for many years and are very happy to have him join our senior management team as we continue our solar expansion.” Warren served 17 years as President of Washington Gas Energy Services, Inc. (WGES), a mid-Atlantic competitive electric supplier and recognized leader in renewable energy. He received the Solar Leader – Industry award by the Maryland-D.C.-Virginia chapter of the Solar Energy Industries Association (SEIA) in 2011. Warren will also be leading a range of new programs that allow environmentally conscious customers of all types and sizes to benefit from solar power’s improving economics. “Progressive laws and regulations around the country are opening up new solar purchasing opportunities including community solar programs, solar gardens, and virtual net metering. Community Energy has been an early participant in many of these programs and is ready to use what it has learned to expand those efforts,” noted Warren. Since its inception in 1999, Community Energy has pursued its mission to accelerate the deployment of renewable energy at scale by developing more than 1,000 megawatts of solar and wind power projects. Building on a successful track record of bringing renewable energy for new markets, the Company’s recently developed community solar projects deliver fixed-price, climate-friendly solar generation to commercial and residential customers. The Company serves over 100,000 customers in utility sponsored renewable energy purchasing programs and competitive retail power markets. Headquartered in Radnor, Pennsylvania with offices in Boulder, Colorado, Community Energy has a strong presence in both eastern and western renewable energy markets. For more information about Community Energy, visit www.communityenergyinc.com and www.communityenergysolar.com.